See the gardening secateurs that I was using to trim a bush when the branch broke and my hand slipped? See the finger on my other hand that got in the way of the blades? See the finger after the doctor finished the repair job? See how I temporarily have one fewer typing fingers than usual? 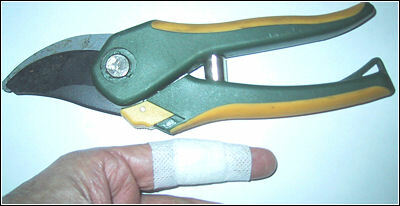 The secateurs can cut through about 1cm of tree branch and lopping off a finger would be no trouble at all, so I suppose I should consider myself lucky that the damage is restricted to a cut going around 50% of the circumference of the finger and there was no damage to tendons or bone. I don't think that there will be much guitar practice around my place for the next week or so. As for the autism resulting from the mercury in the tetanus shot, I will just have to wait and see how bad it gets. Seriously, typing is difficult enough with fewer than the usual fingers (I have to change which fingers I use for which keys) and it is also quite uncomfortable because of the way I have to hold my hand (and the finger hurts), I have to watch for any adverse interaction between the antibiotic and my normal diabetes medication (there shouldn't be any, but they share some unpleasant possible side effects), the particular antibiotic I am taking doesn't seem to have any effect on blood glucose (although it can cause false readings in certain circumstances!) but stress and infection do so I have to be wary, and everyday things like tying shoelaces and turning on a tap to get water for the tea can't be as automatic as usual. Consequently, I will have to limit what I do here this week. This list has been travelling around for some time. I don't know who originally wrote it and there was a bit of anonymity about the person who sent it to me, but I like it and it bears repeating. If the original author would like to contact me I will of course acknowledge its provenance. You feel insulted and "dehumanised" when scientists say that people evolved from other life forms, but you have no problem with the Biblical claim that we were created from dirt. On October 31, baby slaughterer Alan Yurko pleaded guilty to three charges of burglary and one of aggravated theft. He will be sentenced on November 21. A charge of drug possession had been dismissed a few days earlier. (It looks like he was just in the wrong place at the wrong time when the police raided a house looking for cocaine and scooped up everybody who was on the premises at the time. Someone without the resources to find a $250 bail deposit is not likely to be a useful customer for a coke dealer.) The absurdity of the cocaine possession charge was compounded by the fact that he was facing a sentence three times as long as he served for the death of baby Alan. Because he couldn't raise bail, he was imprisoned for more than a year before the charge was dismissed, although this might be moot as he was also being held on the burglary charges. I have commented before that it is difficult to have any sympathy for someone who beats a child to death, but there is a real possibility that Yurko might not have needed to return to a career in crime if promises made to him when he was being used as a poster boy by the anti-vaccination liars had been kept. After all, he doesn't appear to be a very competent burglar because he keeps getting caught. I recently raised the matter of the way he had been abandoned by his erstwhile friends as soon as his usefulness to them was over with one of his strongest supporters and she was quite open about it. Her position was that he had gone back to his old haunts and companions so anything that happened to him was his fault. She had no time for my argument that he wouldn't have needed to go back to crime if the job offers and pretences of friendship had been real. She simply didn't care what happened to him now, and it was time to move on to new ways of campaigning against vaccination. Still, why should I expect even a hint of human decency from people whose pleasure in life is endangering the lives of children? Elli Perkins believed the nonsense from Scientology that there is no such thing as mental illness, so she would not let her son Jeremy have treatment for his schizophrenia. He is now receiving treatment at the state's expense, because on March 13, 2003, (L. Ron Hubbard's birthday) Jeremy stabbed his mother 77 times. The CBS program 48 Hours covered the tragedy on October 28, 2006, and you can see the video below. There will be no update to this site next week as I will be attending the Australian Skeptics national convention. If you can make it to Melbourne for either or both of the two days there is still time to make a reservation. 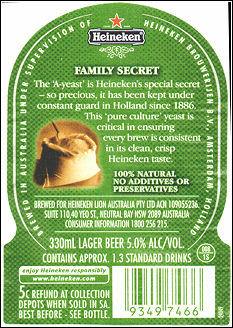 As I did last year, I will buy a beer for anyone who can tell me the secret password. The ANZ is Australia's third-largest bank by market capitalisation. Her Majesty has her salary from her above-top-secret government job paid into an account at the ANZ. Customers and shareholders of the ANZ probably assume that their money and the bank's assets are being carefully managed. At least we can be sure that the stacks of banknotes are kept in a very tidy condition. 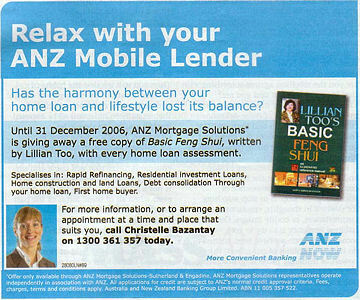 It gives a whole new meaning to the expression "arranging your finances". In response to last week's list of signs that someone is a fundamentalist Christian, regular visitor and correspondent Richard Scheffler sent me a list of ten signs that someone is an Australian. To allow for Australian Goods and Services Tax he sent 110% of the list. My only quibbles are that no Australian thinks that a koala is a bear and Number 10 is obviously about people from New Zealand. And what's wrong with travelling with a stuffed bear? You misspell common words like "color" and "honor." You believe a large island is actually a small continent. You know all the words of "Waltzing Matilda." You know "Advance Australia Fair" exists but know none of the words. Your head of state is a woman who lives thousands of miles away with no apparent qualifications for the job. In addition, she can't understand a thing you say. You pronounce "Aus" as "Oz" as in "The Wizard of..."
You think Mel Gibson is a great actor. A large marsupial is a feature of your country's achievement of arms. Another nasty tempered, foul smelling, slow moving marsupial is the symbol of your national airline. You think said marsupial is a bear. You have strange feelings about sheep. You travel with a stuffed bear. The products of the Heineken corporation are very highly rated at my place. Now I find that not only do they make excellent beer, but they also run lotteries and want to give me a million pounds. Somehow, however, I feel that one of the world's largest brewers would have their own domain and wouldn't need to use a Hotmail address to write to me. They might even know that Australia isn't part of Africa. Your Reference and Batch number at the top of this mail: Please you are adviced to complete the form and send it immediately to our Promotion manager through email or fax for prompt collection of your fund. NOTE: All winnings must be claimed within 20 days from today. After this date all unclaimed funds would be included in the next stake. Remember to quote your reference information in all correspondence with your Promotion Manager. Note that this program was largely promoted and sponsored by a group of philanthropist, industrialists from the internet hardware industry and some other big multinational firms who wish to be anonymous. Next Thursday I will be going to the Sydney MindBodySpirit Festival with a reporter from the television program A Current Affair. I don't know when the segment will go to air, but as the MBS festival is only on for four days and ACA only runs on week nights I would assume that it will appear on either Thursday or Friday night. If you have never been to one of these festivals I can highly recommend a visit, although you will have to have your emotions under control otherwise you will fluctuate between deep sadness and consuming hilarity as you walk past the often crazy exhibits. Most of it is harmless fun, however, if you allow "harmless" to include "taking money under false pretences". A lot of it is voluntary taxation, some of it is dangerous quackery (although this seems to have been getting better over the years), and some of it is even good and useful. I always manage to buy something, even if it's only a bottle of chilli sauce or a CD of relaxing music inspired by swimming with dolphins. Probably the most important advance in the area of public health made over the last few months has been the availability of a vaccine against the human papilloma virus, strongly linked to cancer of the cervix. As this form of cancer is a major killer of women around the world and the methods of testing for its presence are less than perfect, having a vaccine is wonderful news. If you are not opposed to vaccines, of course. The following saga was played out on the Usenet newsgroup misc.health.alternative this week, and shows how mad things can become when an anti-vaccination ideology is combined with a total resistance to admitting any error. I rather slyly and sarcastically congratulate her on the message and for bringing us the good news. I do not expect a coherent response, as another thing this poster is famous for is absolute concrete thinking so sarcasm, allegory, metaphor, etc go over her head at an altitude which almost puts them in orbit. The original poster butts in with a comment about the CDC and its "vested interest" in Merck. I reply that we are talking about Australia where the CDC has no influence and the vaccine is manufactured by Commonwealth Serum Laboratories (CSL). Without bothering to see what, if anything, I had said in response to the comments mentioned in 4, the poster then offers the following bizarre non sequitur as full comment: "The PBAC has vested interest". I ask for evidence of this and receive the following: "It's all over the net--but you knew that". The response to my pointing out that the PBAC's refusal to allow the vaccine into the PBS must have cost CSL tens of millions of dollars is "And the four stockholders, and the 58 members who have a vested interest. Look it up". I do indeed look it up, and provide links to the PBAC, the PBS and the list of the 14 (not 58) members of of the PBAC. I also reiterate the nonsensicality of suggesting that a committee which takes possibly hundreds of millions of dollars out of the pocket of a vaccine manufacturer is somehow acting in that company's interests. At $465 per dose the demand will be limited, but at $29.50 every sane woman between 10 and 26 will be rushing to get the shot with every shot returning just as much to the manufacturer as those provided at full cost. Now here's where things get really weird. The poster responds to this by removing everything that I have said, reverting to the single statement "The PBAC has vested interest". She then reproduces in full a quite insane magazine article from 2003 in which I am outed as being a member of the Illuminati. (The article was not a surprise to me. It amuses me so much that I have had it available for download from here for a very long time.) She finishes off with "Now watch Peter try to trash Jennie Burke". I ask what Jennie Burke has to do with Gardasil, the PBAC, or anything else even remotely related to the conversation. The reply is to remove my words, repeat the full text of the mad magazine article and say "He is so predictable". I give up and look for something more useful to do. You might think that this is an isolated incident and not representative of all alternative medicine supporters. Unfortunately, it follows a well-established pattern of alternauts rejecting anything which contradicts or conflicts with what they think they know, even if admitting being wrong makes no difference. You can see some more about this phenomenon here. It's been a hectic couple of weeks. There was TomKat's wedding in Italy, the launch of the Pope's new book (unfortunately too far away in time from the wedding to combine the two events in a single trip), Thanksgiving dinner at the White House, my daughter's 18th birthday, and the Australian Skeptics National Convention. I'm still catching up after all the excitement (and catching up with real life work as well) so this week's update will be a little patchy. Normal transmission should resume next week. The convention was excellent, and a couple of speakers provided some useful (and informed) input into the debate about climate change, global warming, and what we are and could be doing about both. The 2007 convention will have the environment as its main focus, and I am looking forward to hearing speakers from all parts of the spectrum. This is something which we might have only one chance to get right, and (unlike, say, Holocaust denial and the people who deny the existence of AIDS or mental illness) there are respected scientists with differing views who can all make useful contributions to the debate. My own position is that while I might joke about how global warming could benefit me by moving Ratbag Castle from the middle of Sydney to the eastern suburbs and a water frontage, it will be no joke if we really do get it wrong and Manhattan, Melbourne and most of Bangladesh disappear. This is one case where I believe that the precautionary principle should be employed and if we can reduce greenhouse gas emissions we should, but we have to be wary of extremists on both sides of the argument. The other main thrust of the convention was the media and how it interacts with and can be used by the skeptical and critical thinking movement to spread the word. Unfortunately, I came back from the convention to find that Australia's most respected television network is replacing its premier science program over the summer break with a series touting the successes of psychic investigators. I don't mean people who investigate psychics - the show is about people who use psychic powers to do the investigating. This time of year is called the "silly season" in medialand, but I never expected the Australian Broadcasting Corporation to be at the vanguard of the silliness. It is traditional to award two prizes at the Australian Skeptics convention - Skeptic of the Year and the Bent Spoon. The name of the first award doesn't leave room for much confusion, and the 2006 Skeptic of the Year is Dr Karl Kruszelnicki. Dr Karl works for the ABC (among other jobs) and wears colourful shirts, so nothing more needs to be said to explain his win. The Bent Spoon Award is "presented to the perpetrator of the most preposterous piece of paranormal or pseudoscientific piffle" and this year went collectively to the retail pharmacists of Australia for their practice of overcoming both their professional training and cognitive dissonance to sell homeopathy and other nonsense alongside real medicines. This convention was also the occasion for the announcement of the inaugural Australian Skeptics Prize for Critical Thinking, which went to Dr Martin Bridgstock for his university course encouraging critical thinking. A special award was made to Kylie Sturgess, a high-school English teacher, who has managed to teach thinking in an English class rather than a science class. The chopped finger - The bandages are off the finger that I almost cut off a week or so ago. The finger is still very tender around the wound, but it looks like everything will heal up eventually without any residual problems. I haven't lost any nerve function, and the only problem now (apart from soreness) is that I have lost some mobility in the finger and it won't touch the palm of my hand without being forced down. I expect that this will get better with some exercise. I played some Django Reinhardt to remind me how much damage you can do to your left hand and still be able to play the guitar, but as I don't claim to be a musical genius like him I am just happy that I still have all the fingers I need for the limited number of chords in my repertoire. The huge number of vaccines - I haven't received a reply to my email to the president of the Australian Vaccination Network asking her how eight vaccines against twelve diseases given in a schedule of 24 shots becomes "50 vaccines by school age". I didn't really expect a reply, because I can't imagine how any reply could both make sense and be truthful. The MindBodySpirit Festival - I apologise to anyone who sat through episodes of A Current Affair expecting to see me wandering among the woowoo at Sydney's MindBodySpirit Festival. The plan was to go in the morning before I drove to Melbourne for the convention. Unfortunately the expedition had to be cancelled at short notice because of some staffing problems at the television show. I have a date with the reporter to go to the festival next May. I s he talking about gay pride? You can see more about the Mannatech scam here. My friend Richard from the Mystery Investigators has suggested building a collection of photographs of skeptics reading Richard Dawkins' latest book, The God Delusion, in different places. I hope to have a review of the book here shortly (as well as a review of Unintelligent Design by Robyn Williams), but in the meantime, here is Cody The Religion Hating Dog relaxing on my front porch and waiting for the next Bible-thumper to come along. The reason I say "religion-hating" is that the JWs and Mormons don't need to ring the bell to tell me they are about to start proselytising because I wouldn't hear it anyway over the barking, growling and other signs of doggy displeasure.